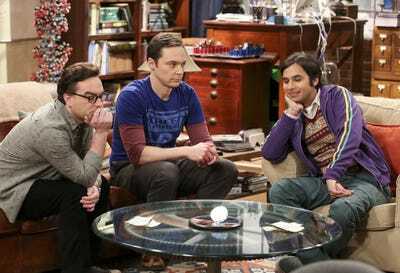 Michael Yarish/Warner Bros.‘The Big Bang Theory’ stars, from left, Johnny Galecki, Jim Parsons, and Kunal Nayyar. Bill Gates will guest star on an episode of “The Big Bang Theory” next month. Details about the episode are sparse, but Gates will star as himself, and the guys will do “everything in their power” to meet him. This will mark Gates’ first appearance on the show. Tech legend and Microsoft cofounder Bill Gates will finally make an appearance on America’s favourite sitcom about nerds. According to Entertainment Weekly, Gates will guest star in a episode of the CBS comedy “The Big Bang Theory,” set to air next month. There aren’t many details about his appearance yet, but we do know that Gates will star as himself. Penny (Kaley Cuoco) will host Gates at work, and the guys will do “everything in their power” to meet him. Gates joins a handful of tech and science legends who have guest-starred on the show including astronaut Buzz Aldrin, Elon Musk, Neal deGrasse Tyson, Steven Hawking, and Steve Wozniak, who have all made appearances on the show, which started in 2007. Another tech billionaire who had a fun cameo in entertainment is Amazon’s Jeff Bezos, who appeared in “Star Trek Beyond” as an alien.